Asheesh is the President and CEO of Junior Achievement (JA) Worldwide, one of the largest NGOs in the world dedicated to educating young people about financial literacy, entrepreneurship and workforce readiness. With offices in over 100 countries, JA serves more than 10 million young people annually with programs designed to activate youth for the future of jobs. 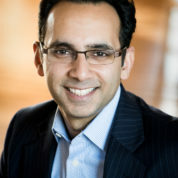 Asheesh is an accomplished technology entrepreneur, having served as CEO of Covestor (acquired by Interactive Brokers) and CircleLending (acquired by Virgin Group). He began his career as a consultant at the Monitor Group followed by the World Bank. Asheesh is actively involved in the World Economic Forum as a member of the Civil Service Advisory Council and the Global Agenda Council for the Future of Education, Gender, and Work. Now living in Boston, he is a JA alumnus first exposed to entrepreneurship as a teenager participating in the JA Company Program. His experiences as an entrepreneur and leader were chronicled in case studies at Babson College and at Harvard Business School. Asheesh is a graduate of the Wharton School and Oxford University, where he was a Commonwealth Scholar.